Third in a series of four scoping workshops, part of the Marine CoLaboration initiative on Valuing the Oceans, by the Calouste Gulbenkian Foundation in London, UK. Andrew Barnett, Louisa Hooper, Sarah Ridley, Sandy Luk, Andrew Farmer, Heather Koldewey, Aniol Esteban, Giles Bristow, Amy Pryor, Nicola Frost. The workshop began with Louisa’s summary of her phone conversations with the participants. She quoted one participant: “I enjoy going for a long walk, but i also like to know there is a cream tea at the end of it.” The 'cream tea' might be different for each of the individuals For the Foundation the Marine CoLAB group needs to define what the 'cream tea' is for themselves. The outcomes could be single large initiative (a big idea to transform the future), or several smaller collaborations and partnerships. Defining the boundaries and scope of the collaborations likely going to be needed. Furthermore, the process itself is an element of the 'cream tea' as well: it’s important to provide a safe space to think and to test the thinking. 8 July, workshop that will build on the previous ones. As this workshop is coincident with NESTA labs conference, there might be speakers invited to speak about Marine CoLAB about their LAB approaches. 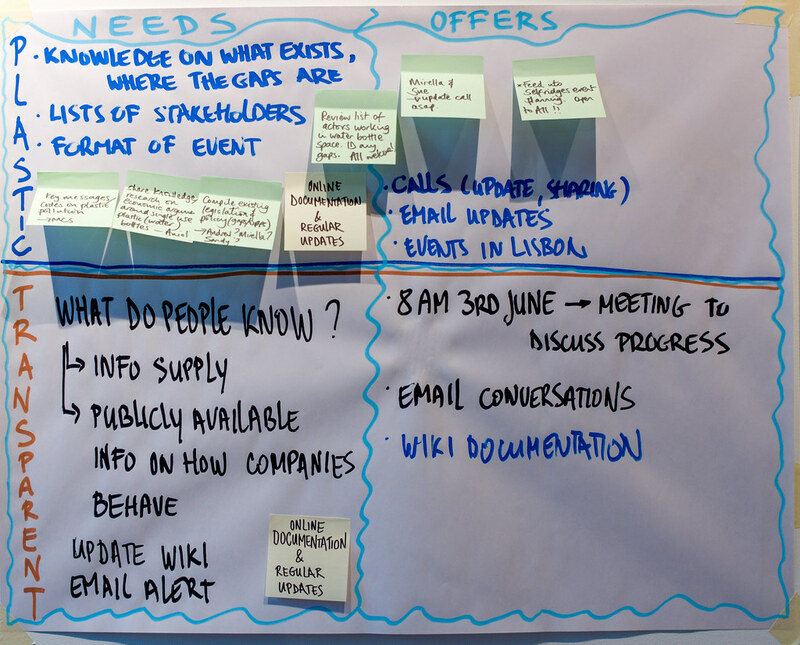 By the end of this workshop it should be clearer what and how participants want to work on. The workshop is likely to start in the late morning (~11:30) and continue through dinner in the evening. 23/24 September (arrival 22nd evening, departure 24 evening or 25 in the morning). The aim of this trip is to get to know each other in a different context, to visit the study site (marine protected reserve), meet people at the CGF HQ and several Portugese NGOs. 11 November. In the evening of the Marine CoLAB there would be a showing of a (selection from) the CGF funded Marine film festival programme (in a small cinema in Shoreditch). There will be a discussion around valuing the oceans with lab members, funders and other invited participants (~40 in total). Liminal space […] was tricksterish and, like Raven stealing fire from the gods, I learnt one of the secrets of the universe: up close, the laws of possibility are not fixed. They can be risked, experimented with and gambled on. Between the boundary of what is possible and what is not there is a field: a space of transformation the universe only releases in the dusty arena of action, trying, failing and trying again. The threshold between what is and what could be is rich in potential for change. Maja framed the third Marine CoLAB workshop with a twofold purpose: building on the themes and experiments from the previous workshops and deepening the connection with the participants’ organisational contexts and current work. While the first two workshops focused on introductions to individual personalities and talents, this workshop began with introductions to participants’ professional situations. The participants reflected on how their existing work can contribute to Marine CoLAB. After the introduction the participants moved into a discussion on the emerging themes of Systems Change, Changing Perceptions and Public Engagement. The discussion presented these themes as broad challenges for Marine CoLAB as a whole and looked at the relationship to the proposed (or new) experiments. As part of a LAB approach we expect to have several feedback loops between the big picture and iterative experiments: while the first version of the experiments was designed in the previous workshop, it is useful to explore if and how the experiments develop the themes (and if they don’t, then adapt or leave the experiments behind). By the end of the morning the aim was to have a better grasp of the themes and their relationship to Marine CoLAB in general and the experiments in particular. In the afternoon the group agreed which experiments they would want to develop. They could either continue developing existing designs or finding new ones. Before the designs were finalised, they were tested using a role playing exercise called a pre-enactment. The aim of this lab exercise was to test some of the participants’ assumptions from different points of view, in a safe space. The workshop ended with a design and planning session for groups to clarify their implementation plans (and be able to answer; “why, what, how, who and when” for each experiment). 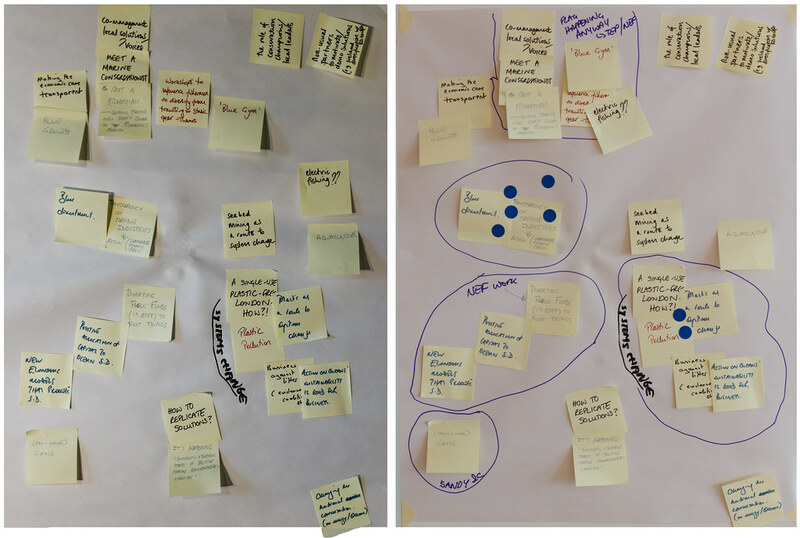 The aim was to provide a concrete action and reflection plan to finish the first small scale experiments by the next workshop, without losing sight of the big picture. The experiments should allow the participants to experience what it’s like to collaborate with each other, to learn their strengths and weaknesses, interests and expertise in a relatively low risk environment. This process also allows the participants to have (some) experimental results on which they can build sound conclusions and develop larger initiatives. After the second workshop some participants voiced concern that we are not thinking 'big' or 'ambitious' enough, and there are others who feel we’re moving too fast and coming up with experiments too quickly. As a small reminder: the LAB approach is an iterative process that can encompass different rhythms at different times, ideally without losing perspective. With each iteration experiments can gradually expand in scope and complexity, while always being able to fall back on a previous, tested experiment, instead of failing massively or having to start from scratch. Heather Koldewey, who was absent at the previous workshop remarked that there needs to be a clearer way to include any absentees in the experiments. She volunteered to follow up with two absentees to help them find ways they can contribute to the progress of the experiments. There also needs to be a stronger ownership of experiments and one or more people taking responsibility for moving the work forward. Mirella von Lindenfels works at IPSO, International Programme on the State of the Ocean on strategy for negotiations, international diplomacy, regulation at international level, looking at deep sea mining, IUU regulations, chemical pollution & plastics in the oceans, etc. She is starting a new project which includes a large oceans communications campaign for the general public, using different target audiences and various ways to explain value of the oceans. The challenge is to balance economic, moral and ethical dimensions, which Marine CoLAB might help integrating. Giles Bristow’s has at least three directions in his work at the Forum for the Future that could be relevant to Marine CoLAB. He is looking at how to reconceptualise supply chains as value chains or more non-linear value networks “Sustainable value networks”. This could provide be a lens to look at areas that can be changed, more helpful than an isolated finacial description. The second project is the “Scaling Impact Framework”, which presents building blocks that tend to be outside of control of innovators. Thirdly, he is working with the shipping sector to ask 'what does a sustainable shipping industry look like?' this includes technology and finance, such as the fund for North Sea. Nicola Frost at Fauna and Flora International works on site-based safeguarding of marine protected areas & sustainable fisheries, with an interest in embedding site-specific work into a wider context (using a systems thinking approach). FFI are operational in 18 countries and work on access, finance, adaptive reflection and incentives for behavioural change. Their work includes community engagement and empowering local stakeholders through capacity building. Although their scale is quite local, they have an understanding of wider issues and look at how national and international challenges might impact the relationship between people and biodiversity. They’re interested in innovative approaches to the governance of marine protected areas, such as co-management in order to incentivise people and change perceptions. Their current focus is on fisheries, pollution, oil & gas. They believe in a constructive engagement with business, including impact investing, improving fishing practice, public/private funding models. Aniol Esteban of the New Economics Foundation is interested in the fundamental change of economic systems that is required to deliver sustainability & social justice. His work is a balancing act between long term change & short term engagement ('daily corrections') to drive change, which involves a range of different strategies, from changing policy to finding new narratives, capacity building, etc. One of NEF’s key roles is speaking the language of economics. For example, working with economic models of the Common Fisheries Policy to understand sustainability, trade-offs, jobs, CO2e, profit, etc. They look at macro-economic structures that strengthen the economic capacity of marine conservation. A few examples are the 'Marine Socio-Economics Project' (http://www.mseproject.net), 'The blue new deal' restarting marine conservation conversation - prosperity of coastal communities and the EMFF, directing fisheries fund into the 'right directions'. Sandy Luk at Client Earth focuses on rules, which include laws, but also include spoken and unspoken habits, conventions, codes of conduct etc. They defend the right of people and wildlife to a healthy life. They ensure that good rules are in place and that the rules are clear enough so people can can stick to them. If no good rules exist, they work on reforming them. For example, in the Common Fisheries Policy (CFP)they work to ensure that the wildlife rules (protected areas) are applied to fisheries (i.e. no exemption for fishing). If good rules exist they ensure their proper implementation. If the rules are broken, they can proceed to legal enforcement through the courts. They are also interested in finding gaps in rule systems and working on voluntary codes of conduct (e.g. sustainable seafood coalition (SSC) working with supply chain codes and labelling codes (defined terms and standards). Andrew Farmer of the Institute for European Environmental Policy works on policy analysis of European environmental laws. They work with diverse organisations with an EU focus. They look at rules, gaps, implementation and implementation failures. Considering the complexity of EU regulation, they work on better structuring and formulation of EU environmental law. In the marine field, they work on TEEB analysis for policy makers and analysis of coastal zones. Their work includes training and economics. Andrew works on waste legislation, that has large gaps for marine litter. The gaps are related to 'historical legacy problems (e.g. the Baltic sea), whose effects on the policy need to be better understood and integrated in decision making. Recently they have been involved in the 'Greener Britain' UK environmental policy manifesto (see http://www.ieep.eu/assets/1417/Greener_Britain.pdf), but they usually work more behind the scenes. Heather Koldewey heads the conservation programme at the Zoological Society of London. Her work is science based, with both an academic focus and work related to their two zoos. Their marine work focuses on protecting ocean wilderness, solving challenges at the interface of poverty & marine biodiversity, and species conservation (e.g. 'flagship species' such as seahorses). Their primary method is collaboration and finding new partnerships (beyond comfort zones and usual suspects). They focus on solutions to counteract the dominance of doom-and-gloom in marine conservation. See #oceanoptimism. There are many solutions out there, the question is how to find, replicate and scale what works. She focuses on connecting communities instead of re-inventing the wheel. Current projects include a collaboration with Selfridges, and a project with the manufacturer Interface to recycle fishing nets into carpets. Amy Pryor works at the Thames Estuary Partnership, a neutral, non lobbying, non advocacy organisation. They are the secretariat for Coastal Partnerships Network, their work is hosted by the UCL Vice-Provost for research. This gives them the ability to convene multidisciplinary projects in areas of social justice, marine biology and engineering. Their geographic region extends from the tower bridge to the north sea (possibly up to Chelsea in the future). They are starting to move to EU level (c.f. water framework directive) and work with national frameworks such as the 'catchment based approach' which proves problematic around London (terms of reference). They are involved with Thames Estuary 2100 (TE2100), looking at flood defences to protect London over the next 100 years (including new wetlands) not just for humans but for all species. They work to engage social communities through projects and partnerships, looking at bottom-up co-management, small scale interventions and societal change through apprenticeships and curriculum of the 'River Academy' (transferable skills learned from environmental projects). Sue Ranger of the Marine Conservation Society was absent, so Louisa mentioned her work with the 'community voice method' bringing new narratives from different views in films, allowing people and their issues to become real to each other. There are strong economic arguments to increasing the health of a natural asset which connects to human livelihood (eg. job creation, see Gone fishing experiment designed at the March workshop). Being in closer contact and having more interaction with marine protected areas can make a difference in resource management. Where is the onus of resource management in various places? How to bring the ocean closer to the people? Working with communities with tenure over resources can help. There is always a 'champion' who takes initiative, surrounding communities take notice, which can be a potential source of replication. although it can be quite slow. Locally, awareness could be raised, e.g. that London boroughs are all 'coastal' wrt. Thames estuary. The perception of marine conservation being a threat to economy is not shared globally, for example in the Philippines marine protected areas (MPAs) are considered aspirational, as something that needs to be invested in. How can this diversity of views be made apparent worldwide? How can diversity of views contribute to diversification of livelihoods? How can successes be scaled up? It often looks like there is only 'dabbling' in alternative livelihoods, with a lack of 'viable alternatives'. How to get over the meme that 'environment is always a cost to business'? How to prove the benefits of marine conservation and show that it is productive? Different connections to business should be explored. There is much talk of 'blue growth'. Is this a threat or opportunity? What are possible levers? There are lessons be learned from climate change, where new biz models, innovation wrt. 'solutions' are being developed. Once a solution is identified, replication becomes an issue. There are different methods to either work with individual 'pollinators' or community→community replication, but both are quite ad-hoc and often rely on geographic connections. Are there ways to make this more systematic, more trans-local? 2. It is about more than just cost/benefit: Cost/benefit analysis provides a skewed method for understanding trade-offs or long term changes. The relationship between costs and benefits often tend to be skewed toward immediate cost reduction: *small costs often over-ride large benefits*. There is a need to change this perception especially for *decision makers*, to allow them to look at the broader picture than the narrow cost/benefit analysis. Which *tools* could they use to include the big picture in their equation? To better understand long term effects? 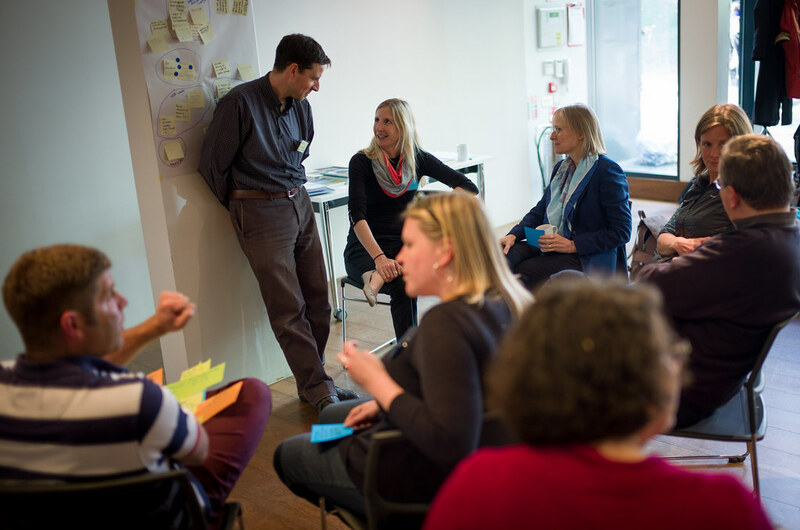 See Valuing what matters experiment designed at the March workshop. A widespread post-GFC perception is that the “environment is a luxury” and revealing 'hidden value' in economic terms has a limited impact (c.f. healthy food). The long-term nature of marine conservation is a challenge from an economic perspective. MPAs work, but in many cases have a time frame that is seen as 'too long' (i.e. at least 5~10 years) to establish, that is usually longer than political and economic cycles. 3. Marine NGOs are not just animal lovers: If marine NGOs are seen as more concerned about animals than people only small part of the population is reached. Furthermore, businesses see the work of Marine NGOs as generally being 'bad for business'. More contact with businesses, speaking the language of economics and engaging diverse communities could help change this perception. In the previous workshop, The Charm Offensive experiment was designed to tackle this issue. What does Marine CoLAB mean by 'systems change’? Systems change can be brought about by looking at a common issue and collaborating from different perspectives for multiple benefits, through a set of interventions and multiple ripples. There are many different systems related to the marine environment. It’s interesting to map them as they are, as they have been and also look at how they could change. Environmental, economic and governance systems, local and global systems are all intertwined in valuing the oceans. Which systems are working, failing or in need of change? Does one have to be out of the system in order to change it? How much can change be made from within? Where are the meaningful boundaries? Are they linked to geographic concerns, shared issues, involved sectors…? Systems change can happen through collaboration, by actively looking for 'windows of opportunity' in wider discussions, grassroots initiatives, disruptive business models, etc. The best practices need sharing, especially successful scaling and replication initiatives. A systems-level observation is a way to keep track of relations between deliberate actions. This type of observation makes it possible to find key points of influence, access and change. Plastic pollution: how to analyse it from a systems perspective? could all Marine CoLAB participants use their skills and resources to tackle this issue? how to leverage and transfer best results? can we link water frameworks directive and marine strategy directive using 'litter' as an indicator? In energy production there are interesting developments related to community owned resources. what are the corresponding developments in the marine environment? Legal issues: what are the individual cases? are there precedents? how can cases be scaled? What to do with the double pincer of 'top down' legislation and 'bottom up' moral decisions? Once common issues (or a common boundary) is identified, the group can work on finding opportunities that connect all participants. In the previous workshop one of the experiments was designed to map a range of systemic levers existing in the Marine CoLAB, using tools like horizon scanning (of big trends and emergent issues), common interests, tipping points, audiences… This mapping exercise is meant to take on a strategic, forward looking approach to identify a potential focus for the group. In the area of public engagement Marine CoLAB is competing for attention. The competition is strong and diverse - there are many 'causes', communicated as being the most relevant, urgent and important to people’s lives. How to deal with that? There are frames and frameworks that have proven their worth. Sometimes extremely well planned initiatives can work, other times ad-hoc, surprising and unpredictable actions can work just as well (e.g viral media spread). 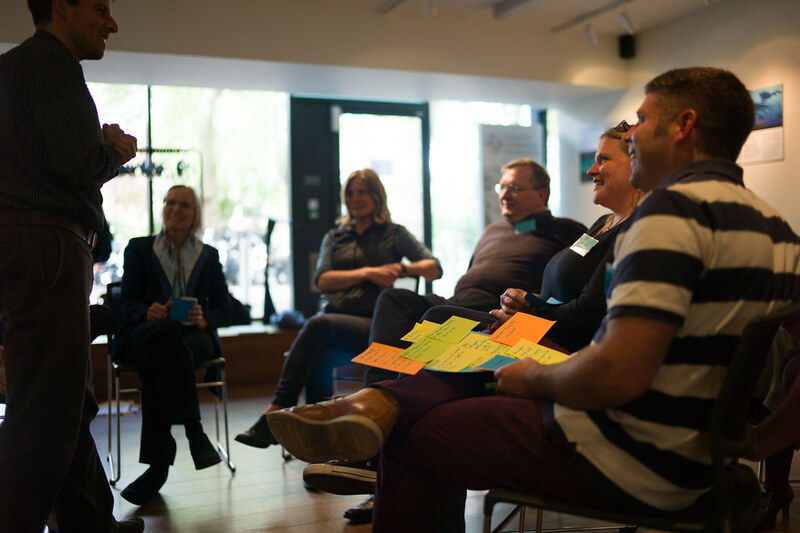 When it works well, public engagement influences a shift of tone, so people can begin to speak differently about an issue, which changes discussions leading to a change of attitudes. SkyTruth is an example of public engagement using satellites (“if you can see it, you can change it”). Public engagement relies on serendipity and can act as harmonic shifts or tidal waves across society. The aim of public engagement is a long term change of a general mindset (and therefore linked to “changing perceptions”). With changing mindsets comes a value shift which can lead to radically different decision making. To instigate a value shift public engagement must move beyond singe interventions, towards portfolios of opportunities based on a clear set of long-term messages and 'lines in the sand'. To engage the public in a meaningful way, it should be clear who the target audience is, in what are they being engaged, and how, when and where will they be engaged (e.g. divestment re. marine destructive biz, new biz models, etc). Citizen science (including science games, simulations etc.) as a method of engagement has a lot of potential in both public engagement and changing perceptions. It is important that the public has an agency that extends beyond the game or the individual intervention of another sort, to provide new, changing narratives (which can be translated into long term plans) and paints a picture towards a preferred future. In the previous workshop the Game On! experiment was designed to explore public engagement with rules using a game. The hypothesis was that the public could be best engaged at various specific points of legislative process. This would be explored through a game where players would learn about the legislative process and the consequences of different decisions at particular times. The underlying theme was to help clarify people’s relationship to the ocean. In the game there could be progressing levels of engagement, from understanding the problem and then moving to solutions. Games asre seen as having a lot of potential, but it is a potentially difficult channel (kids growing up with games). Games which are seen as 'blatantly educational' are often problematic. Different types of games appeal to different ages and genders, so the challenge would be to create a game which rovides an engaging understanding about the big picture. The journey of the users of the game should extend well beyond the game itself and provide opportunities for changing mindsets in their daily life. Several new topics for further experiments and/or feasibility studies were proposed, two of which were selected by the group. Plastic pollution from a systems change perspective. In the pre-enactment (a role-playing exercise of a situation that could happen in the near future) the two experiment teams met their key stakeholders (played by other participants) whom they wanted involved in the follow-up of their successful experiments. Scenario: You have just concluded your successful Marine CoLAB experiment and have presented some of your findings at a prestigious public event. After a long day of presentations, you are hosting a dinner for some people you'd like to involve in a new project. This project will take your experiment to the next level. You would like these people to be involved in the design of your initiative, but you may still have more questions than answers. The dinner is held on a nearby island. There is a 15 minute ferry ride during which you will have a chance to talk to your stakeholders, answer their questions and find potential partners, funders, or anything else you may need for your Marine CoLAB initiative to succeed. Transparency of Marine Industries implementation: Mapping and scoping the state of the art in (marine) transparency initiatives, as well as determining key environmental indicators. The experiment teams will take the lead on their respective tasks, and will invite all Marine CoLAB participants to contribute information, expertise, research, contacts and feedback. In the July workshop the progress and possible follow-up will be presented, discussed and evaluated.